Ordinate dimensions are continuous measurements from a reference entity. This style of measurement is typically useful for analyzing manufacturing operations where relative distance between entities is required. For example, if you need to calculate the amount of travel of a tool bit and need to measure the distances between drilled holes in a component, ordinate measurement helps you to quickly figure out the distances between holes and the standard reference entity. In the latest release, we have added a new feature that enables you to continually drop the ordinate dimensions. This tool is located in the Measure tab. Select an entity ( a point or edge ) that serves as the reference. Now continue selection along a axis to place the ordinates dimensions. Download Glovius to try Ordinate Measurement and write to us with your feedback. We recently launched a Glovius Plus plan that allows your to export CAD parts and assemblies to STEP, IGES and Parasolid formats. 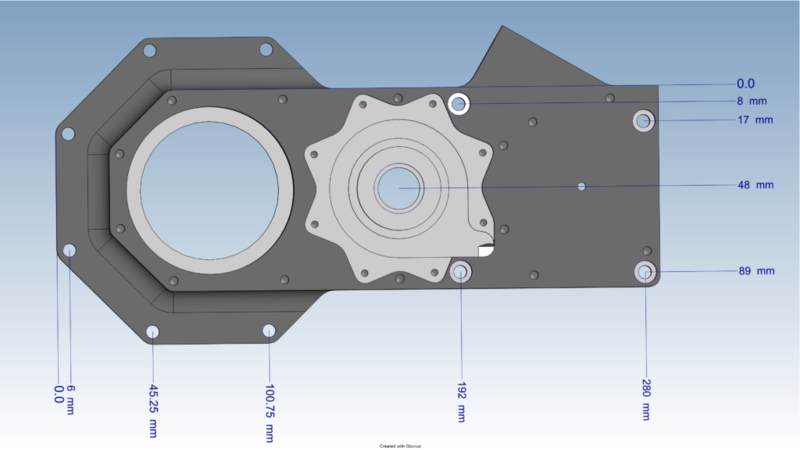 We are adding even more options to export your CAD files to various formats. In this release, apart from a number of visual and performance improvements, we have added Measure and View analysis tools that adds to the usefulness of 3D HTML files. Use anywhere : Independent of any application and platform. As most modern PC’s are preinstalled with a modern browser that support WebGL and hence 3D HTML files. Zero file management : Generate 3D HTML files of your assemblies and reduce the persistency issues while sharing inter-dependent files. 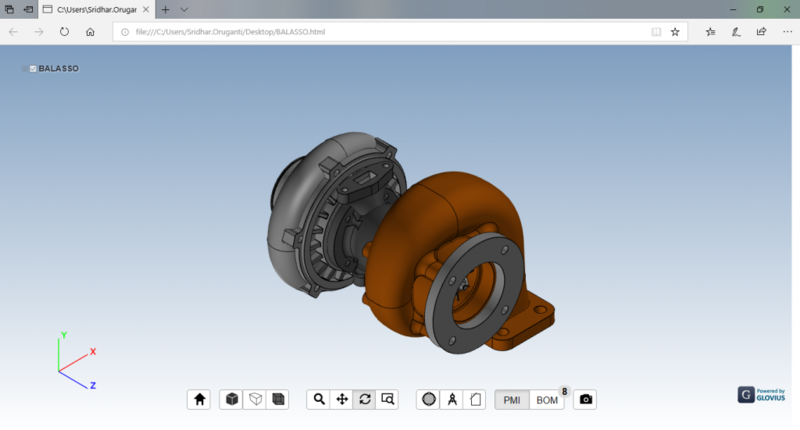 Download Glovius today and try out the latest improvements and export your CAD parts and assemblies to 3D HTML. We are excited to announce a new plan – Glovius PLUS. STEP files have become the defacto standard in CAD data exchange. With the Glovius PLUS plan you can now export your CAD parts and assemblies to standard data exchange formats. You can also export to IGES, Parasolid and 3MF formats. 3MF is a universal specification for 3D Printing industry and supported by a variety of founding companies like Microsoft, Autodesk, Dassault Systems, PTC and Siemens. Glovius also supports a variety of STEP application protocols like STEP AP 242 which is useful for MBE ( Model base engineering ) scenarios . 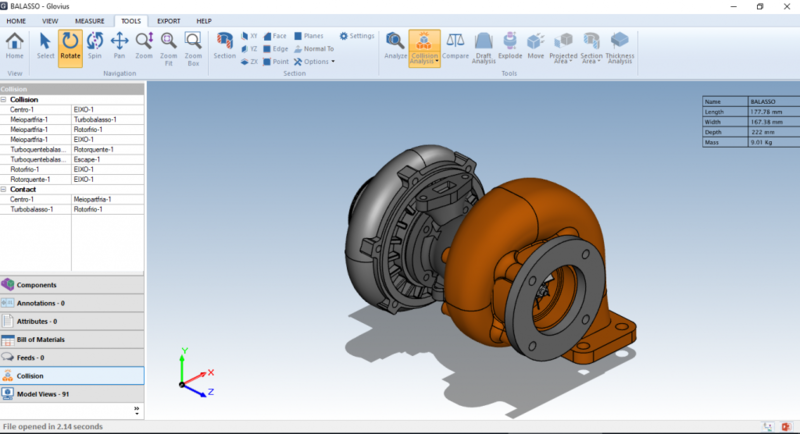 Export your CATIA, Solidworks, Creo, NX and other CAD file formats to STEP and share it with your team and suppliers. Drop us a mail at support@glovius.com to try out the Glovius PLUS plan. Check for CAD assembly integrity : Quickly analyze whether the various components in the assembly have been assembled properly. With a single tool analyze the spatial arrangement of component parts and sub-assemblies in an assembly. Check if the assembled position of the component has intersections that compromise the overall integrity of the assembly. Verify CAD assemblies : Detect and verify if components maintain the recommended clearance values. This is especially useful during system integration checks. Glovius provides you the ability to check the Collision, Clearance and the Contact information of the assembly constituents. You can either calculate the collision among all the constituents or select two components and analyze their relative positions in the assembly. Download Glovius today and analyze your CAD assemblies faster. Watch this video for an overview, register for an account and start using the Glovius cloud service for collaboration.